I went out this weekend to celebrate one of my oldest friends birthday. We've been friends for 7 years so it's nice to still be able to pick up and hang out. 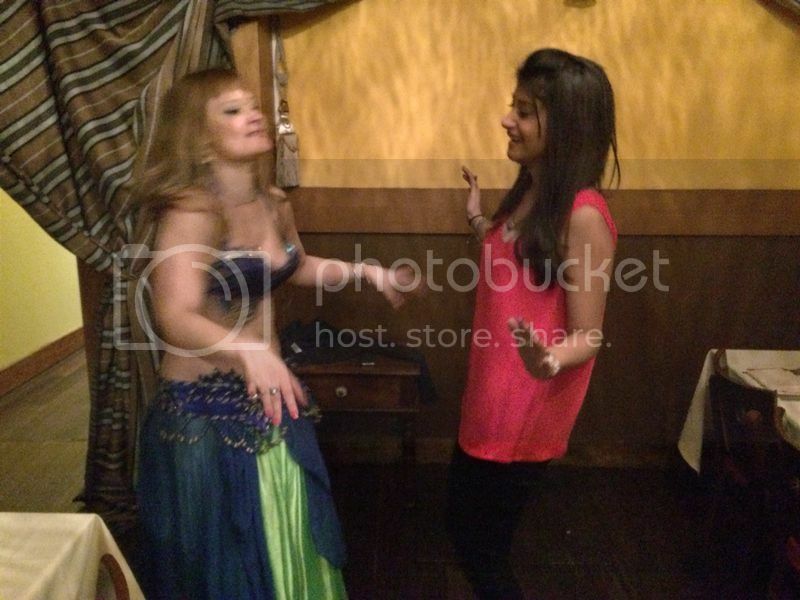 We went to a really nice restaurant, with a belly dancer, so naturally I had to get involved. I've been wearing so many dark colours lately, that it was nice to include some colour into my look. This is a cute layered top and I can't wait to wear it a lot more. Although, I had to cover up with a cardigan - it's definitely still far too cold to sit anywhere - even indoors - with bare arms. Although, I'm trying to show them off a bit. I've just started doing weights at the gym so they should be looking good for the summer. And also loving my blue booties. They're a fun suede and the embellishment at the back gives it a really unique look. It definitely adds a little bit of glam to the rest of the shoes. You're very beautiful. 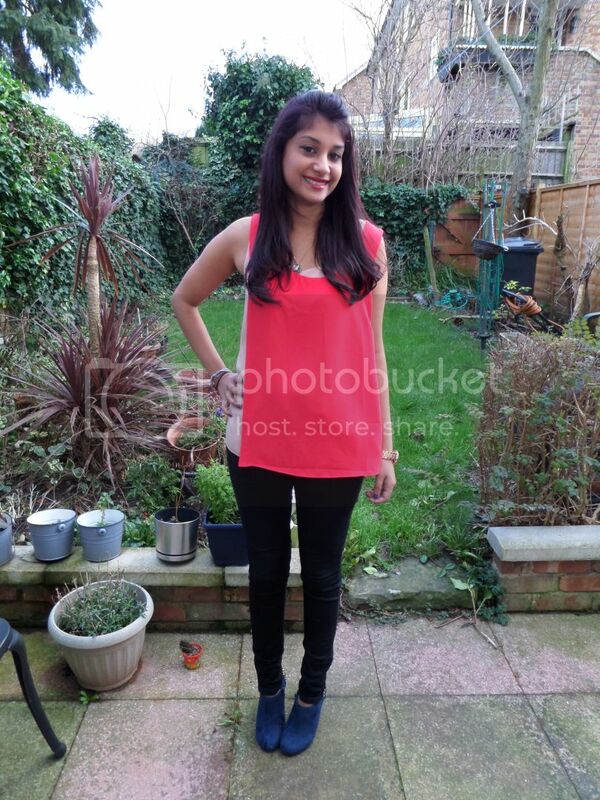 I love the top and what amazing shoes! 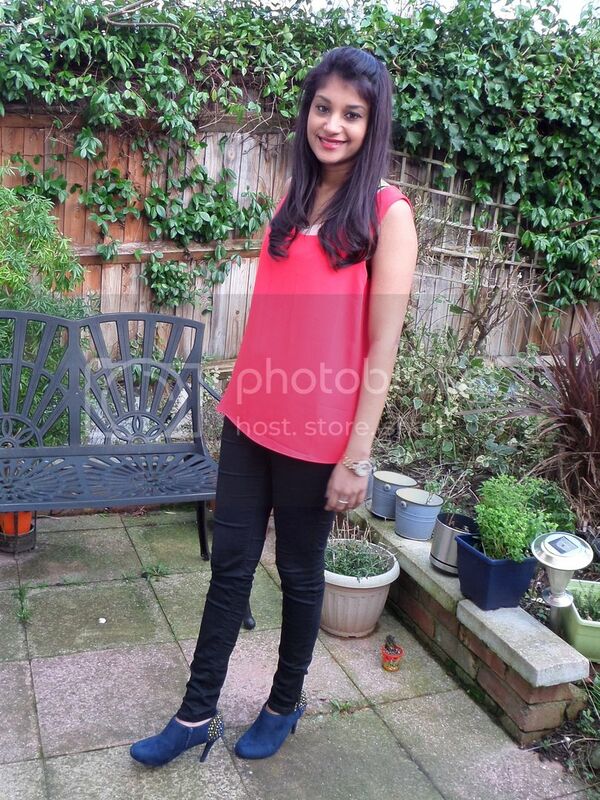 I LOVE this look on you, Sherin - the top and shoes are gorgey! Belly dancing looks so much fun - I've always wanted to take it up! This outfit is so colourful for you, but I love that - the pink shades of the top suit you really well. And what better than a bold blouse for a night out that involves a belly dancer? I love that you got tips from her! Looks like a fun evening! the top looks lovely on you. That is one of my favourite colours. Love the colorblocked top and oh, those embellished booties, they´re gorgeous! Love the blue booties - reminds me of Elvis "Blue Suede Shoes"
Love your shoes so much!!!! !